Our Toledo Rockets Large 4x6 Flag is made of thick woven polyester, is a Large 4x6 feet in size, has sturdy quadruple-stitched fly ends, and 2 metal grommets to attach to your flagpole or tailgate pole. The college insignias are screen printed into our Toledo Rockets Large 4x6 Flag which results in a durable and quality flag. This Toledo Rockets Large 4x6 Flag will show the entire neighborhood your team allegiance and can also be used a large wall decoration. 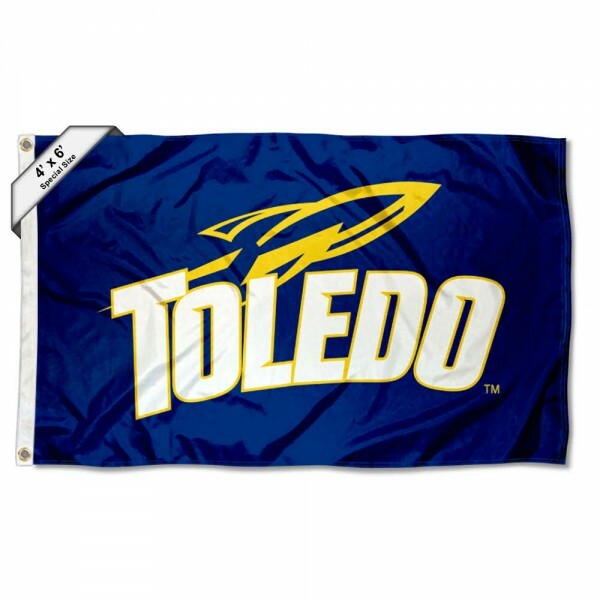 Fly your Toledo Rockets Large 4x6 Flag with our 20' or 28' tailgating flag poles.